Getting air after a perfect Ollie, the brunette boy skateboarding personalized Christmas ornament will put a big smile on any rider's face! These are quality resin skateboarding ornaments personalized with his name and the year in an attractive font - we use the computer font in the photos just for clarity. A holiday cord offers quick and easy display of these kids ornaments on the tree, in his room or hanging from his backpack. 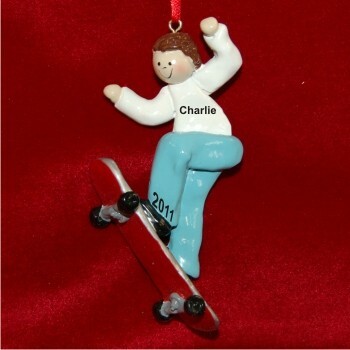 Let him know you like his style with the male brown hair skateboarding personalized Christmas ornament that arrives in a plush velvet drawstring pouch, a Russell Rhodes exclusive!